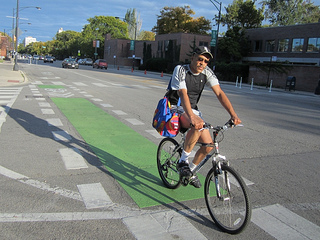 Chicago: What do people really think of the green lanes on 55th St? 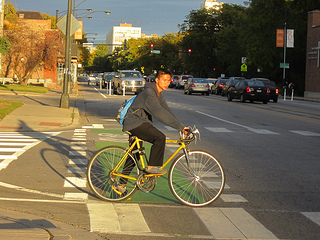 Bike planners and advocates get excited when green lanes appear on city streets, but how do regular folks feel about them? 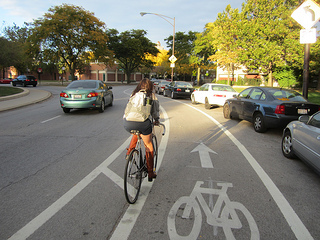 To get a better idea, I pedaled to 55th Street in Chicago’s Hyde Park community, where the city recently built new protected bicycle lanes. A square-mile of land on the city’s South Side, surrounded by parkland to the west and south and Lake Michigan to the east, Hyde Park is famous as the home of the University of Chicago, the Museum of Science and Industry and the Obamas. A dense, ethnically diverse college neighborhood, it naturally boasts a high bike mode share. Although Hyde Park is generally a bike-friendly, walkable community, 55th Street, an east-west road that bifurcates the district, was a four-lane with fast car traffic that that formed a barrier to pedestrians. And while the thoroughfare should have been a logical bike route to the lakeside beaches and the 18.5-mile Lakefront Trail greenway, it was an intimidating place to pedal. In June the Chicago Department of Transportation put the road on a diet. 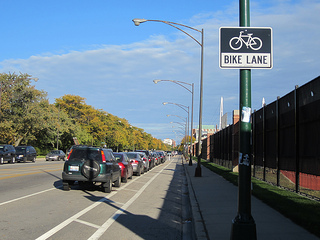 For a .75-mile stretch between Washington Park and Lake Park Avenue, the department removed travel lanes in each direction and replaced them with protected bike lanes delineated by flexible posts. On-street parking was relocated from the curb to the left of the bike lanes, so people on bikes are shielded from motorized traffic by the parked vehicles. Meanwhile, the removal of the travel lanes means shorter crossing distances for pedestrians and calms the motorized traffic, creating safer conditions for all road users. As work and classes let out on a sunny autumn afternoon, I saw dozens of people using the lanes, especially near 55th Street’s intersections with Woodlawn and University Avenues, north-south streets that run near the campus. I buttonholed various people who live, work and/or study in Hyde Park for their thoughts on the new facilities. ?I really love them,? said Cynthia de la Rosa, a U. of C. undergrad who was waiting to cross 55th Street on her yellow Schwinn. ?I live off campus so I have to cross 55th to get to school. The bike lanes make it much easier to get across. And now I feel like I have the option of riding on 55th. Before I would have avoided it at all costs.? College students Andrew Kam and Christina Chan were unlocking their bicycles from a rack on 55th Street after shopping at Treasure Island Foods. She was using a two-wheeler from the university’s ReCycles bike share system. ?I think the protected lanes are a good idea,? Kam said. ?People generally don’t like you riding on the sidewalks so it’s good to have a dedicated lane.? Chan said she appreciates not having to worry about car traffic when she rides in the lanes. ?Usually when I ride I?m worried about cars that I can’t see coming up from behind me.? David Jones, owner of the shop DJ’s Bike Doctor, located on 55th, said he likes the lanes in theory, but there seems to be a learning curve for drivers. ?The problem I?ve seen is that people don’t understand that they have to park to the left of the bike lane, not next to the curb, which blocks the bike lane. ?Cause if they’re not going to park right then it’s not going to work right.? Manuel Quinonez, a manager at 55th Street’s Seven Ten Lanes bowling alley and tavern, said the city gave his business a heads-up before the bike lanes were installed, and he hasn’t heard any complaints about them from customers who drive there. ?It’s great to finally have a safe way for bikers to get across the neighborhood,? he added. ?For the most part it’s been a very positive thing.? Art history professor Persis Berlekamp was walking her bike on along 55th with a friend on foot. ?When they work the way they’re supposed to, the lanes are great,? she said. ?The only problem is if a delivery vehicle or an emergency vehicle parks in the bike lane, you have no maneuvering room for a Plan B. Whereas if you?re riding in the main part of the street it’s more dangerous but if something comes up you can move. But in general [the protected lanes are] much safer and I feel much more comfortable riding in them.? Melvin Taylor was walking back to his home on 55th Street after riding a Chicago Transit Authority bus from his downtown job. ?I think the bike lanes are a great idea,? he said. ?I?m all for safe pedestrian traffic and bike traffic as well. Parking-wise [the lanes] took up a couple of extra spaces but it was worth it. People are driving differently now because this was a four-lane road and now it’s a two-lane road. It’s really noticeable at night. There aren’t a lot of speeding cars because this slows down traffic.? He added that with the new lanes he now feels comfortable pedaling to the lakefront on 55th with his kids. Noticing some cycles in the window of a Jimmy John’s Subs location on 55th, I ducked in to get the staff’s opinion of the new lanes. Stan Wallace, a delivery biker, said the new facilities make his job easier. ?They?re useful because I don’t have to worry so much about cars crossing my lane and cutting me off,? he said. ?So they’re doing their job pretty well. We could use more of them around.? On the other hand, Wallace’s co-worker Rob Hagovian, a delivery driver, was disgruntled. ?It’s hard to go anywhere,? he groused. ?I?m always stuck behind ten cars at the same stop sign over here, because there’s now only one lane in each direction.? But even Hogovian conceded that the protected lanes are getting plenty of use by folks on bicycles. ?We?re located by a college campus though, so I can’t really complain,? he said with a shrug. ?There’s always going to be lots of people riding bikes.? So while not everyone is in love with the new lanes, I got the sense that they’re getting good use and a majority of Hyde Parkers feel positively about them. And as motorists get more accustomed to driving and parking in the new street configuration, I’m confident more people will view them as a great addition to one of Chicago’s iconic neighborhoods. All photos by John Greenfield.